It’s not often we report on anything coming out of Canada. Sure, we’ll report about happenings in the states, reports out of the UK, and naturally any new material we find from Japan… but Canada always seems to get lost in the flurry. This time around, Edmonton Journal, out of Canada, is listing their top games of the decade. Surprisingly enough, Twilight Princess took home the #4 spot, beating out Resident Evil 4 for the same position. What do you know? 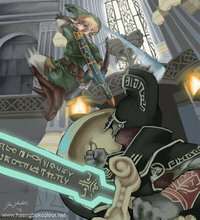 Maybe when I made a case for Twilight Princess being the Best Zelda Ever, I wasn’t full of it.